Activity classifications provide a basis for classifying faculty members into useful categories within FACULTY180. They enable tracking of activity characteristics, such as the review type for a scholarly work (e.g. blind peer, editorially reviewed). Setting up activity classifications is a critical step in preparing for accreditation reporting. 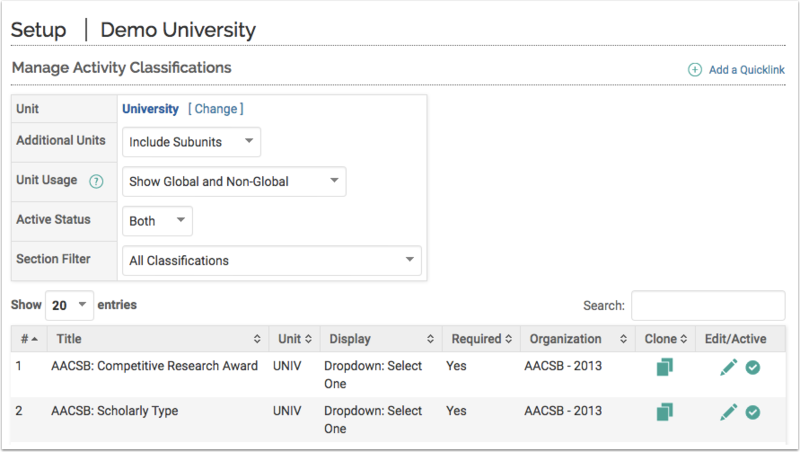 FACULTY180 contains several options for displaying and managing activity classifications, based on which units the activity classifications are assigned to and excluded from within your institution. In the Customize section, click Activity Classifications. The Activity Classifications screen displays. Select an existing unit or add a new unit. The Manage Activity Classifications screen displays a list of all activity classifications currently assigned to the selected unit and subunits. If necessary, select a different unit or subunit by clicking the Unit Change link. Upon selecting a different unit or a subunit, the list of activity classifications that are displayed may change. Click the Additional Units arrow to specify if the list of activity classifications should include those assigned to parent units, sub-units, or the selected unit only. When adding a new unit, global activity classifications (activity classifications that have not been excluded from any unit) will be applied to the new unit. Administrators can change which activity classifications are assigned to the unit as necessary. Click Activity Classifications in the Customize section. The Activity Classifications screen displays. Click Add. The Activity Classification Form displays. Specify the settings for the new activity classification. When you are finished making changes, save the information. Once created, faculty members and their surrogates can enter activity classification data as activities are input into FACULTY180. The organizational unit that an activity classification is assigned to is important because it limits the visibility of that classification to the faculty members within that unit and to its sub-units. After activity classifications data have been entered, they can be used to filter reports. 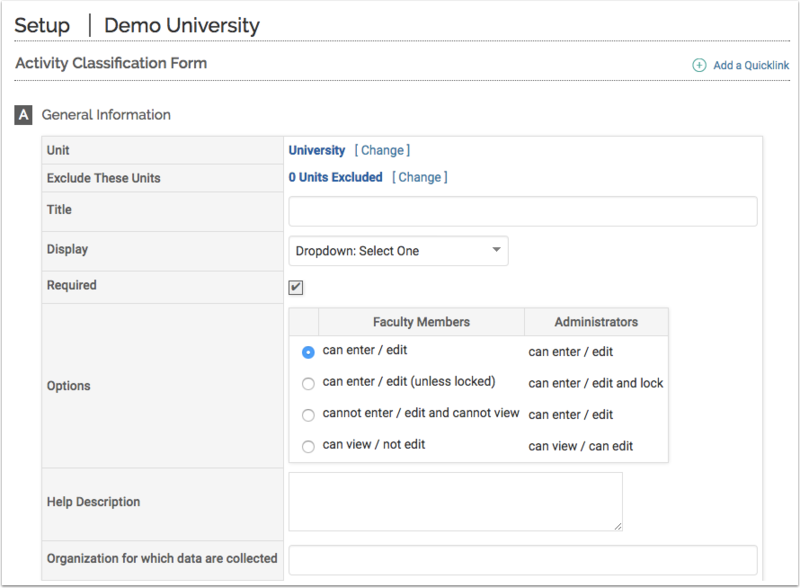 For example, your institution can generate a report showing trends of faculty members’ scholarly activities and filter those activities by the review type options shown (blind peer-reviewed, editorially reviewed, invited, non-blind-peer reviewed, and not reviewed). Click the unit associated with the activity classifications to be changed. The Manage Activity Classifications screen displays. Click the Edit icon adjacent to the activity classification to be changed. (Activity classifications can also be cloned and activated/deactivated from here.) The Activity Classifications Form screen displays.